John Bolton on America's Course of Action John Bolton is best known for his tenacious tenure at the United Nations, and for his tough, no-nonsense talk. The former ambassador and State Department official answers questions about foreign affairs, diplomacy and U.S. policy toward Iran and North Korea. 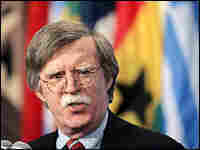 John Bolton is best known for his tenacious tenure at the United Nations, and for his tough, no-nonsense talk. The former ambassador and State Department official answers questions about foreign affairs, diplomacy and U.S. policy toward Iran and North Korea.